In certain parts of the world extensive areas are largely and sometimes entirely dependent on deep-bore wells for their water supply. Such deep-bore wells are called artesian because they were originally supposed to have originated in Artois, France. AT WORK ON A 12-IN DIAMETER BORING. This view, taken from below the pulley of a sheer-legs, or derrick, shows men setting the “string of tackle”, at the lower end of which is the cutting bit, with “jars” or sliding links, between the chisel and rope socket. IN the widest and most generally used sense of the term an artesian well is any deep boring carried down through impermeable rock strata of the earth’s upper crust into a water-bearing stratum below. Borings intended to reach strata containing oil, brine or gas may similarly be classed as artesian wells. The true artesian well, however, is one in which the water or oil gushes to a height from the top of the boring because of the great pressure exerted beneath an intervening layer of impermeable stratum. Artesian wells take their name from the former French province of Artois, known to the Romans as Artesium, for the practice of deep-well boring was long supposed to have originated in that district. A well was sunk at Lillers, in northern France, in the twelfth century and it has been delivering water without any artificial pumping aids ever since. It is now known, however, that the practice of boring deep wells has been familiar to the Chinese for many centuries and it is possible that the artesian well was invented by Chinese engineers in the far distant dawn of Eastern civilization. The most remarkable thing about these early Chinese borings is that much the same method of sinking artesian wells - namely, using a percussive as opposed to a circular cutting motion - is shown to have been invented independently in the Far East and in Europe. Percussion boring was the method adopted in boring all the early deep wells, but whereas Europeans used rods the Chinese used hollow tubes. Various reasons govern the sinking of deep-bore wells. They may be sunk through non-water-bearing strata until they reach a stratum fully permeated by water from a distant source. Again, they may be sunk through strata bearing water of a type undesirable for drinking or other uses, to reach a geological level containing good water. The wells of the Metropolitan Water Board are good examples, notably those sunk at Deptford, London. THE GEOLOGICAL FORMATIONS of part of Great Britain are shown in this diagram, which illustrates a section from Wales to London. The nature of the formations must be thoroughly investigated before artesian borings are made. New Red Sandstone generally holds a plentiful supply of water, and water is often found in Oolite strata and in Old Red Sandstone. London lies in a trough of chalk. The edges of the trough form the hill ridges of the North Downs on the one side and the Chilterns on the other, but the chalk stratum of which those are outcrops passes right under the Thames Valley at a great depth, joining the two ranges of hills. In that subterranean chalk there is good water, naturally maintained at a considerable pressure by the overlying mass of London clay, through which it cannot “find its own level”. The water drawn from the wells at Deptford thus comes straight from the chalk downs. It is uncontaminated by any leakages through the superimposed layers, and it needs none of the elaborate purification processes meted out by the engineers to the water that they draw from the Thames. Deptford water has originated as rain on the distant downlands, and when the well borers tap it they find it as pure and clean as in the places where it entered the ground. A still more remarkable instance, where the same natural principle is involved, may be found in the Sahara Basin of Algeria. Here the prospectors carried their borings down to a great depth and tapped a stratum which outcrops in the Atlas Mountains, over 300 miles away. In this instance it was clear that the water had, in part at, any rate, travelled through open underground channels and wide fissures, and had not merely percolated through the rock. For in some of their borings the engineers recovered, not merely water, but also small fish and water creatures of various kinds normally found in the mountain streams of the Atlas Range. To understand something of the principle of artesian boring it is first necessary to make a study of the natural laws of hydrostatics and of the nature of various types of soil and rock. A layer of porous soil - gravel and sand, for instance - is a rapid absorber of water. That does not mean that it is an ideal water-bearing soil. The well-borer may sink his shaft to a considerable depth through such soil without tapping tlie looked-for water supply. But suppose that beneath that layer of porous gravelly soil there lies a layer of clay impervious to water, and that the water passing through the gravel immediately above that clay stratum has no other downward means of escape. The well borer will then eventually strike water before ho reaches or pierces the clay below the gravel. The water in the London chalk circulates through fissures under considerable pressure and, when tapped, comes a long way up the bore, even though it may not form a “gusher” at the top. Another great source of water, especially in the south of England, is found in the greensand strata. Between the Upper Greensand and the Lower Greensand lies a layer of clay material known as the gault. The water engineer who sets out to tap the Upper Greensand needs to take particular care not to penetrate this gault; for, though water-bearing in itself, it contains various salty and other constituents which would completely spoil the quality of the water taken from the Upper Greensand immediately above it. The borer who penetrates the Lower Greensand to obtain its water has to pass his shaft through the gault, and he must take special precautions to make that part of the shaft immune to percolations from the gault itself. A remarkable artesian boring carried down into the Lower Greensand was undertaken on land belonging to a firm at Slough, Bucks. The well-boring company responsible for this work carried its shaft down to a level of 1,035 feet below the surface of the Thames Valley, through clay, sand, chalk, Upper Greensand and gault. After having penetrated the Lower Greensand, the borers were rewarded by a tremendous gush of water at the surface, the initial flow being 25,000 gallons an hour. The final delivery amounted to 100,000 gallons an hour at a pressure of 145 lb per sq in. This was the first example of a “true” artesian well - one delivering a fountain of water without any mechanical aid beyond the boring - to be sunk in the neighbourhood of London. SPRING-LOADED PUMP BUCKETS of the type used for raising water in artesian wells. The attachments are fitted to the end of the string of rods in the borehole. The rods are moved by an engine at the surface. Other sources of water in the underlying strata include the oolitic limestones. Water occurs in the Upper and Lower Oolites, but the stone abounds in faults, and it is therefore difficult to determine the depth to which the shaft may have to be sunk to obtain a good flow. The water prospector will obtain a good supply from the New Red Sandstone. Water is found also in the upper strata of the primary rocks, such as Magnesian Limestone and Old Red Sandstone, but otherwise these old rocks are poor producers. Ancient upheavals have wrought innumerable fissures in them, rendering their value doubtful as holders of water. The igneous rocks, those of volcanic origin, are of no value at all. The old-fashioned well with its wide bore and thick masonry walls, though still a familiar enough feature in country districts, may be considered as obsolete. The modern well, even though it may penetrate only to a moderate depth, consists of a boring in the true artesian tradition, and all over Great Britain such borings are superseding the antiquated and laboriously executed up-ended tunnels. The first artesian wells to be sunk in Great Britain date from the second half of the seventeenth century. Sir Christopher Wren, anxious to discover the strength and nature of the subsoil which was to bear the huge weight of his new St. Paul’s Cathedral, caused a number of deep trial borings to be made on the site after the ruins of the old church, destroyed in the Great Fire of 1666, had been cleared away. Wren used the traditional methods of Artois. This instance is one of the earliest of deep borings having been made not to obtain water, but to explore the character of underlying strata. Towards the end of the eighteenth century, numbers of artesian wells were sunk in England, notably on the Lincolnshire Wolds and in the Lea Valley at Tottenham, London. To-day the borings into the chalk beneath London and Paris are sufficiently numerous to make their respective districts the most important “artesian areas” in Europe. At one time boring with rods, the lowest rod carrying a cutting “bit”, was used extensively, and at first the lifting of the rods was effected by hand leverage, as was done in ancient China. Two men at the top of the succession of rods gave them a half-circular motion in lifting them before each successive drop. This ensured, by a natural law, the true perpendicular boring of the shaft. In modern practice the well borer uses a moderate-sized engine for the raising and dropping of the boring tools. This makes the whole operation less laborious and much more speedy than is possible with hand-operated methods. THE LEVEL OF THE WATER-BEARING STRATA determines the depth to which borings must be made before a good water supply can be tapped. The diagram on the left shows how the impermeable London Clay strata must be penetrated to reach the water in the trough of chalk. A fault in the strata affects the depth at which water-bearing strata may be reached; for, although the bores shown at A and B in the right-hand diagram are near each other, B does not need to penetrate as deep as A to reach the water-bearing stratum. For modern borings of moderate depth, through close soil (not rock) the borer uses a series of tubes fitting into one another. The nethermost tube ends in a sharp point, and its circumference above this point is perforated to receive the inflow of water when this is encountered. At intervals those working on the surface drop a plumb-line down the inside of the tube. This will at once inform them of the presence of water in the tube, and will also betray any soil which may have found its way in through the perforations. The simple tube boring methods will not deal speedily with a stratum of hard rock, and for penetrating this, as in the boring of deep artesian wells, a way must be cleared for the passage of the tubes. There are two methods of doing this - battering a way through, and drilling a way. For the former method the boring tool consists of a cutting bit manipulated by a series of rods or by a stout rope. TYPES OF BORING TOOLS used for artesian well-boring vary according to the nature of the ground being worked. 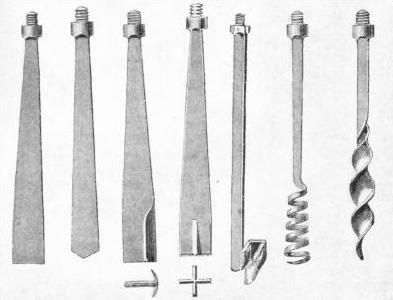 The flat or V-chisel (the first two examples on the left) is used for moderately hard ground. A T- or X-chisel (shown in plan as well as in elevation) is used for hard, rocky strata. The tool on the extreme right is a worm auger, used for loosening strata in boreholes. The other two tools illustrated are known as a spiral worm and a crow's foot, and are used for drawing broken rods. When boring with rods, the borers pass them down the shaft by a screw feed arrangement, each successive rod being screwed into the upper end of its predecessor. In deep borings the drill bit or chisel is attached to the end of the lowest rod by a pair of sliding links. A simple rigid connexion, formed by screwing the cutting bit directly into the end of the rod, and subjected to successive quick, sharp blows, would cause numerous breakages. Each accident to the bit necessitates the withdrawal of the entire tackle, and this operation is succeeded by the delicate task of “fishing” for the broken pieces left at the bottom of the hole. On the down stroke, the bit strikes the rock at the bottom of the hole, the links above it close up and the rod above the bit comes down on top of it, completing the stroke. The bit thus falls by gravity, dropping with a quick stroke, followed in turn by the measured downward beat of the rod. The links close up automatically. On the up stroke the process is reversed, the rods rising first, opening up the links and thus picking up the bit. On the surface above the boring, the tackle is mounted on a derrick or “sheer-legs”, with the boring engine beside it, and a rocker or pulley regulates the rise and fall of the bit down in the rock below. In large borings the stroke of each successive blow may vary from 2½ to 5 feet, and the speed from twenty to thirty strokes a minute. The weight behind the blow may be anything from 800 to 1,000 lb. In addition to boring for water, prospecting and boring for oil and gas were carried on extensively by rod and bit in days gone by, but nowadays rope boring, largely sponsored by American engineers, has come to the fore. In this form, the cutting tools are connected with the derrick above, not by a series of rods but by a length of stout rope. Where rods are used, a great deal of time is wasted by raising and lowering them for the purpose of clearing sludge from the bore, or replacing a blunted or damaged bit. The deeper the bore penetrates, the more time do the borers have to spend on operations of this kind. The borer who uses rope tackle has no need to fit fresh sections to his appliance as the bore deepens. To withdraw the tackle he simply hoists it out in one operation by the rope with which he manipulates it. The “string of tackle”, as it is called, consists in its simplest form of the following items. 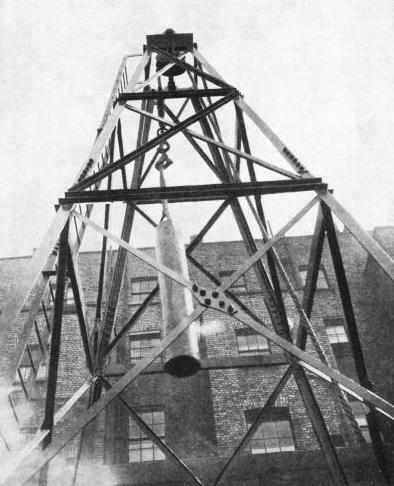 At the top is the familiar derrick or sheer-legs, with its mechanical lifting and dropping gear. At the other end of the rope is the cutting bit, with “jars” between the chisel and the socket for the rope. These jars consist of a pair of sliding links, reminiscent of the links used in boring with rods. The jars, however, serve a somewhat different purpose, which is to produce a sudden sharp shock on the upstroke. The bit, on falling, tends to jam its nose in the underlying stratum and stick fast, and the designers of the rope tackle have intended the shock of the jars coming together on the upward beat to remedy this. Between the jars and the bit itself, the designers insert a heavy bar called an auger stem, by which they materially increase the force of the blow. Above the jars, too, they fit another rod known as a sinker bar, whose purpose is to keep the rope taut—an essential consideration. With bits varying in diameter from 3 in to 8 in, the engineer using this tackle can obtain a boring speed of anything from 20 to 40 feet in twenty-four hours. 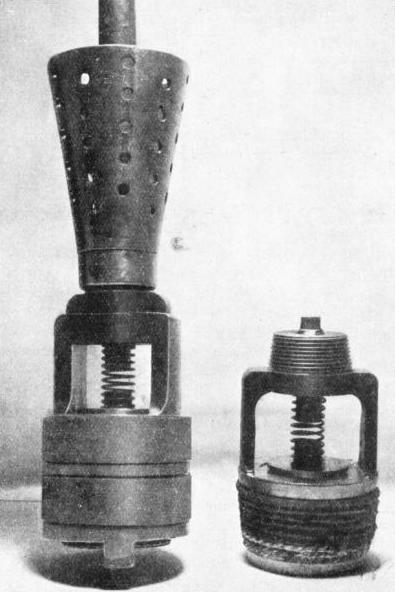 SHEER-LEGS, or derrick, used at the top of a borehole for operating the tackle. A pulley at the apex supports the rope which lowers the various boring implements. Boring tools are of considerable variety. The simple bit consists of a sharp chisel of mild steel or wrought iron with a cutting edge of best hard steel. The chisel edge may, however, end in a sharp point similar to that of a sword, or in a V-shaped point. Bits vary in section as well as in the shape of the cutting edge. Some are of T-section, others of X-section, or again a T-section bit may have a V-shaped cutting edge. For the purpose of boring a smooth circular hole an annular or ring-shaped chisel is used and hollow “shell” of similar section are used by the borers to remove debris, such as dust and sludge, from the borehole. In addition to the cutting instruments there is a great variety of tackle for “fishing”. If, for instance, some part of the string of tackle breaks underground, it is not merely necessary to remove the pieces. As often as not they will have jammed in the borehole and will need to be carefully dislodged, the entire operation having to take place in the narrow space formed by the cutting bit on its downward course. A fishing tool used for this purpose might be compared with a narrow and attenuated pair of callipers, which are self-acting in the same way as the jars supporting the bit. Where he encounters exceptionally dry rock, the well borer will have to pour water down the borehole to reduce the dust to sludge and make it easily removable. Where piping is already in position, it is not difficult to pump out the rock sludge thus formed, but in a yet unpiped borehole, where it passes through rocks of a soft consistency, such as certain types of sandstone, care must be taken not to break down the sides of the boring by an injudicious application of water under pressure. The sheer-legs or derrick used at the top of the borehole for operating the tackle varies in size and complexity, though the principle remains the same. In its simplest form it consists of a steel tripod; in big borings, such as those for oil in the United States, or in the Russian and Iranian oilfields, and elsewhere, it may be a timber tower anything up to 180 feet in height and correspondingly wide at the bottom. In these big derricks the sides are boarded in at the bottom and a roof is provided to protect the borers in bad weather. The other method - cutting a way through - is diamond drilling, used for piercing exceptionally hard rock strata. From a scientific point of view, the practice of drilling a circular hole by rotative means is far superior to battering a way through with a cold chisel. The use of a diamond drill saves labour and increases the speed of boring, besides facilitating the removal of waste material. It is, however, expensive in first cost and cannot be used except through hard rock. The diamond drill, in essentials, consists of an annular bit set with diamonds. This bit is mounted on the lower end of a series of hollow tubes and rotated at a speed of 300 to 800 revolutions a minute, according to the hardness of the rock to be penetrated. 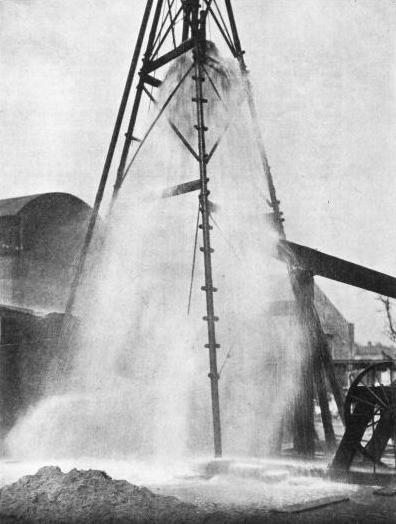 A GUSHER OF WATER from a “true” artesian well at Slough, Bucks, which gave an initial supply of 25,000 gallons and a final delivery of 100,000 gallons an hour. This was the first example of a “true” artesian well sunk in the neighbourhood of London. The drill thus cuts an annular bore, leaving a core of rock in the middle, which can be abstracted with comparative ease. The tubes above are screwed into one another so that the entire drilling tackle from the surface downwards is, in effect, a single tool. While the bit and tubes are being rotated, the borers on the surface inject inside the tubes a stream of water which passes down to the bit and returns through the annular space on the outside of the tubes. This causes the dust from the cuttings to be brought out of the borehole in a continuous stream. The hollow bit is set with diamonds alternately on its inner and outer rims, or diagonally across the rims. These diamonds are of two kinds. The best are black diamonds or carbons, which are harder than the brilliants used as jewels. The other variety consists of “borts” or imperfect brilliants. Borts can be used only on the softer types of rock. The bit, when used for deep artesian borings, varies in diameter from 1 in to 4 in, though much larger diamond bits are used for relatively shallow borings. The diamond drill will penetrate with ease to a tremendous depth, those used in the Rand goldfields reaching 5,000 feet below the surface. 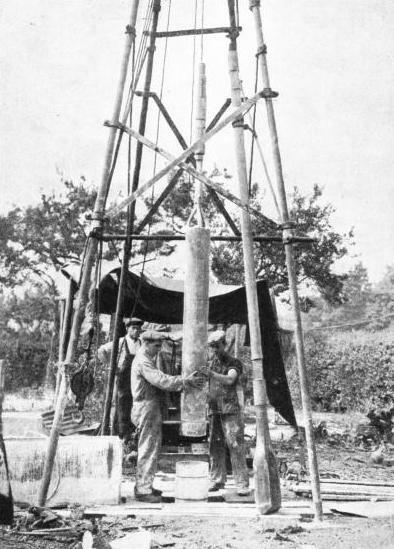 Another interesting operation which takes place in the depths of the borehole consists of firing a “torpedo”. It sometimes happens that, although the drill has penetrated strata known to be water-bearing, no water is forthcoming. The borers deal with this situation by sinking a canister filled with high explosive down to the extremity of the borehole and firing it by electricity. This will open up fissures through which the water will pass into the borehole. A notable example of this took place at Rochester, Kent, some time ago. The engineers had reached a stratum known to be rich in water and duly sank and exploded their “torpedo”. They were rewarded by an immediate yield of water at the rate of 20,160 gallons an hour, a rate which was maintained. Where the water level does not reach the surface of the boring, the water engineers install simple pumping appliances, which vary from ordinary steam pumps to electric rotary pumps. The wind wheel, mounted on a pylon above the boring and kept with its head to the wind, is a familiar sight all over the world. It is a simple and inexpensive apparatus, and it can also be improvised without much difficulty. All over the world vast tracts of land have received immeasurable benefit from the installation of artesian wells. Perhaps Australia is the classic example. Central Australia is a virtually waterless country. To render desert lands useful, the Australian irrigation engineers sank deep wells into the stratum of New Red Sandstone lying below the central plain. They were thus able to bring water to millions of acres which had hitherto been in an utterly arid state. I n Queensland, and to a lesser though considerable extent in New South Wales and South Australia, the sinking of deep artesian wells has put an entirely new complexion on local agricultural conditions. Over 1,000 such borings have been sunk in Queensland - some of them over 4,000 feet deep - into the underlying Cretaceous strata, giving a daily supply of more than 350 million gallons. Many borings have been sunk in South Africa, though there the yield has been less striking than that obtained by the Australian engineers. North America has been a happy hunting ground for the builder of artesian borings. In the Roswell area, which comprises the south-eastern parts of New Mexico, American borers have sunk over 1,400 deep wells, providing water for the irrigation of 60,000 acres of farm land. The largest flowing well in this district yields more than 8,000,000 gallons in twenty-four hours. BORING A 600-FEET WELL with a diameter of 12 inches. 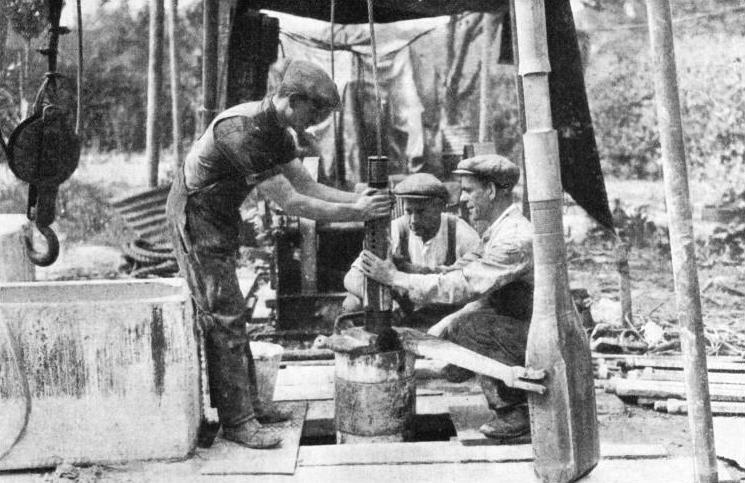 The men are preparing to lower a cylindrical shell which brings up the debris that is left at the bottom of the borehole by the chisels. The debris consists mainly of dust and sludge. The Dakota Basin underlies large areas of the States of South Dakota, Colorado, Kansas and Nebraska, and consists of a layer of sandstone which outcrops in the form of mountains, some 200 miles apart, to the east and west of the area. Its average depth below the surface is about 1,000 feet, and into it American engineers have sunk thousands of borings giving a total yield of approximately 125 million gallons a day. In the Eastern States there is the Atlantic Coastal Plain, extending from Long Island to Texas, also giving a copious yield of water from deep borings. The deepest borings of all, however, have been reached in the American oilfields, where depths upwards of 7,700 feet (nearly one and a half miles) have been reached in West Virginia, southwest Pennsylvania, Texas and California. You can read more on “Artesian Bores in Australia” on this website.